Wondering what information is available about Myacht Houseboats? Can anyone tell me anything about a Myacht? Are they good or bad? What are the pros & cons about these houseboats. Well Jo Ann, from what I have read and heard, they are a very good aluminum pontoon houseboat, with a long list of available options. For someone looking for a good starter houseboat I don't think you can go wrong with a Myacht. Hopefully some of our readers will share and post comments about their experiences with the Myachts to help you out some more. We bought a new one in 2006 and have great experience with it. Very well made. Aluminum floor which is a big plus. Drive and ride a great. Twin mercury's that are dependable workhorses. I would purchase another one. I have had this one for 12 years now and completely satisfied. Worked for them as a foreman on over 140 boats, talk about crooks. The owner has built another, in his words, "sweatshop" in Indiana if anyone needs to find him. Your roofs are scrap pine 2x2s wrapped in a rubber membrane that was epoxied. Never meant to be repaired, only sold. I bought a 2003 My Yacht houseboat in 2006 and I got a 4850 model. When I bought it I did have some minor issues with the motors and generators due to the previous owners lack of usage as you would with any other boat with that problem. Once I worked out the bugs, we've enjoyed the boat since. The aluminum pontoons are great, it is very roomy inside, a great top patio deck on the roof and I have no regrets nor does my family. I just bought a 45 foot Myacht. I need it moved to a repair shop. I live in central KY. Who do I call? I need it moved about a hundred miles. Lots of people ask what the Myacht roof is made of but no answers? I have several soft spots in my 1999 4815 in the rear bedroom above the closet and cabinet where the floor sags about 1-2 inches if you walk on the top. I pulled the interior ceiling panel back to peek inside and can only see 1/8 plywood and foam running up and down with no structure. Is this really all that is holding the roof up? Anyone out there know about the inside of the roof? Have an older Myacht houseboat and the roof is leaking. The roof has carpet on it, and wondering how to remove and would there be a rubber roof underneath? What do you use to seal roof? Recent survey details significant moisture under the roof and recommends roof be replaced. Any idea what will be found under the Myacht underlayment? Thanks. On my '99 3510, the sending unit was on top of plastic gas tank located on a shelf on top of a pontoon compartment. The tank was deformed/warped & sending unit would not seat properly, allowing splashed water to get inside the tank. Tried to replace sending unit & ultimately had to cut into pontoon to replace tank and sending unit & then weld pontoon up. Make sure welder tests for air leaks. Hi, Just bought a 1999 43' Myacht and it has water in the gas tank, can anyone out there tell me where the gas tanks are, and can they be worked on in the water? I found a Myacht after looking for the perfect interior space and this was the closest I found of several different houseboats. I had a survey done before purchase and found the boat design to be riddled with problems. In the previous owners haste and economic situation the boat was jury rigged from top to bottom. Even with the least amount of neglect this boat comes up short (just look at all the major repair jobs and lost boating time by owners). While it is nice to know that the manufacturer was willing to repair these major problems, how long will it take for them to pop up again. One of the major issues I see time and again are failing roof top decks. The one I just dodged had intermittent rot/soft spots on the roof with the entire 8' aft overhang rotted out as another blogger mentioned. The overall design needs reconsidering going forward and should be addressed. I am looking to purchase any type of new/used trailer for my Myacht 45' houseboat? Could someone direct me where to check? Thank you! I bought a 2005 Myacht 4815 houseboat from a very inexperienced owner, and got very little in regards to manuals. Who can I talk to about just general knowledge? Love the boat. I have been towing trailerable houseboats for 15 years. I am on my 4th trailerable boat which is a 32ft Tracker Party cruiser. In your situation, you are only 1000 pounds from maxing out your truck's towing capacity. By the time you load stuff in your boat, you will be over weight and will soon be looking for another transmission. I pull mine with a 2013 Ford diesel and my boat is only 7800 pounds. That 3510 model is too big to be pulling all over the country. Look at the Tracker Party cruiser. It's realatively easy to pull, and you could pull is cross country with your truck. I was seriously considering a Catamaran Cruiser L'il Hobo but recently have been swayed by the Myacht 3508. I read on blogs that it is towable with an SUV however the combined towing weight was listed as over 11,000 lbs. I have an F350 with a towing max of 10,000 lbs. Also, I couldn't find any specs on the overall height of the boat or the towing height. I didn't find any with trailers yet saw that these boats were sold new as a package, trailer included. Can anybody tell me if the roof is aluminum or wood? I have no idea if this is a timely answer, but the raw floor of a Myacht is aluminum. What is the best roof paint for a 2005 Myacht 3510? Great boat, I have a 2006 4815. Very roomy inside and reliable. As for problems, I have had wear and tear issues with the motors, usually fuel injection problems due to lack of use. Steering kit needs replacement every 3 years. Like I said minor problems. My wife and I have a 3510 Myacht with a single 115 OB. It is easy to drive unless windy, easy to maintain and even without an owners manual easy to learn. 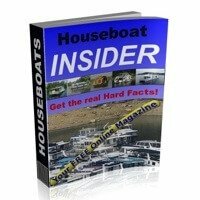 Single Engine Houseboats - any boats with one motor? Does anybody have a Myacht houseboat with the single motor? How easy is it to handle? My husband I just purchased a 2003 Myacht so far we are loving it. The previous owners were lacking on exterior cleanliness, but that was nothing a little elbow grease didn't fix. We love how our Myacht handles. We love our Myacht 4815. We bought it during 2003. It is a 2001 that was special ordered through Myacht. The purchaser changed their mind when delivered and bought a bigger Myacht. The vessel was customized with a flybridge and double bunks in the second bedroom (that has been great). All new appliances were installed, two 2004 Mercury 60HP four stroke EFI engines, and a new Onan 8KW generator. It was a great buy for us. We traded our Myacht 3510 that we had for three years. Everything was beige inside so, we totally redecorated with "color". The boat has performed excellent. However, during 2007 we discovered some bubbles on the sides. Insurance determined it was delaminating due to incorrect sealant used on the roof. Myacht came from their factory in wester Missouri, picked up our 4815 from Lake Cumberland, Ky, took it back to the factory for repairs. They had our boat from Feb 2008 through Oct 2008. It was disassembled to the floor and rebuilt with all new walls (inside and out) and a new upper deck. They restriped it, replaced my horns, replaced the front lighting (outside), and delivered back to us, all at no cost. They even found a small hole in one of the pontoon sections and reskinned it. Their integrity is next to no one else's. We have had it for six seasons so far. I fully recommend owning a Myacht. I can go a whole season on one tank of gas. We are looking for some advice. Our 48' Myacht has rotting on the back of the upper deck. It's under the rubber roof. Has anyone had such experience and what will I find under the rubber. Is this something a novice can attempt to repair or who should be contacted for a roof repair? Thanks for any input. We also love our boat. Myacht houseboat service, quality, and value. They apparently have shut down production on houseboats, hopefully weathering the financial storm, not surprising but I'd bet there are a lot of boat builders in this situation. To their credit I had purchased the last 55ft model made last year and had several issues with it so they have come back and picked it up and are fixing it at the plant. They have gone out of their way to make things right. I am very pleased with the service just a little disappointed in this boat, but as I have previously stated I have had 2 of them, and would buy another!! Great houseboat for the money, hope they begin production in 2010 again..
Myacht is a good boat. At this time they are not building any houseboats. Destination Yachts is owned by one of the founders of Myacht. They sent me information on the line of boats they build. They have models that are just like the Myachts but they also custom design the floorplans and offer more high end finishes. They are very well known out west. They even built a 22 x 75 for Craig Jackson of the Barrette Jackson Auto Auction on the speed channel. I also saw that they are now building some kind of hybrid hull that is the safest full hull and will have twin IOs. I have a 2000 3510 Myacht houseboat. When replacing the carpet we found that it was glued to aluminum. We replaced it with a pergo style wood. We LOVE our houseboat!! I've owned my 48' houseboat for three years and have not had a real problem. The house-boat is basically maintenance free with aluminum pontoon and decking. I have twin Merc 90's and it performs fine. We moved from a large cruiser, for the sleeping quarters and have not regretted it at all. Fuel consumption and maintenance is minimal compared to traditional houseboats. If you can find a clean used one you'll probably love it. They are hard to find and Tracker Marine aren't selling to retail. I believe they are only contracting to large rental companies out West. Are the Myacht wood or aluminum flooring? The Myacht web site doesn't even show the models available, or the prices. The site should be set up like Suntracker Pontoon boats, where there is full information. We have a 4815 Myacht Tracker 2003 houseboat. This is our home in the Florida Keys. We bought it used in 2006. We have had some trouble but I believe a lot of it had to do with the lack of attention that the first owners gave. The Mercury outboard motors are pretty much done, and the water line was above the bottom paint....bad news. We have done major renovation inside to suit our needs and we also replaced the aluminum hulls with plastic pontoons (www.plasticpontoon.com by wilson distribution). So far so good but a lot of work for a 6 year old boat. I would love to see pics of other Myacht Trackers, swap questions, ideas, etc. Destination Yachts is now coming out with a price point line of boats to fill the gap that Myacht has left. The first will be a 14 x 48 two bedroom with twin engines. This boat will sell for about $145,000.00. The owner of Destination Yachts was the founder of Myacht..... They also have most parts available for the Myachts. I have had a 1997, 4313 Myacht houseboat which was a great starter boat.. I bought it used and was so pleased with the help I got from Myacht, and also the parts people at Tracker Marine. I wrote the owner and told him how great his people were.. I now have a new 5515, that was the last boat made by Myacht and the boat show boat in 2008.. It is wonderful.. we have really enjoyed it and the factory folks have traveled to Little Rock 3 times to fix stuff.. they have all been wonderful and I would buy another one! Myacht is now under the Suntracker name which I am not as pleased with, but the new boats look great and have an amazing amount of available options.. I just think the economy has gotten to them just like GM!! I hope they survive.. For the money, there is not a better houseboat on the market.. Tom. If you keep them running once a month and use gas additives you will have less problems...My issue has been somewhat complex. I received a factory recalls on both motors...apparently the voltage regulators have issues. I have a 2002, 48x15 Myacht houseboat, purchased new in May 2002. We're very happy with the boat, and I have every option Myacht has to offer. It's powered by twin 90hp 4 stroke engines, the only bad thing I can say is service from the factory and local dealer were not that good. I had to call the factory several times to get problems fixed, and now everything is fixed. I missed most of my first season because the houseboat was not running well, and I could not get Myacht to come and fix it. They were giving a lot of reasons like, how busy they were, or didn't have anyone to send out to look at it. It took telephone calls to the GM at the plant to get everything fixed. After that, everything has been great with the houseboat. Hi Jo Ann, I just purchased a 50x15 Myacht houseboat in November 2006. Are you still considering a Myacht? 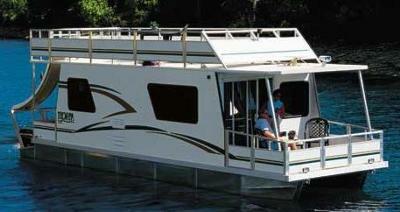 My friend jack bought one of these trailerable houseboats and ask me to go with him to the KY derby one spring. Sounded like a great idea until we hit bad weather just below Carrollton KY. Heading into a storm and weather cooling down I told Jack he better get us in tighter to shore and I was going to put more clothes on. Next thing I knew the boat was on its side and taking on water fast. What a rush ! After I got my bearings straight, realized what was going on I went back towards the bow, the sliding glass door became a large heavy window. Managed to get a cooler under it and I made it to the front deck and started trying to find Jack who thank god was dazed, confused momentarily came around ! He grabbed us two life vests as I got him out to the front deck as well. We sailed on our side to the Indiana shore where we walked to a farm house. I may never get on one again! This is a huge investment for me, and I am going to have to wait until I hear some better news about these folks.